New technology introduced on the iPhone to block distractions while driving has slashed phone use behind the wheel by nearly 10% among users. The Do Not Disturb While Driving feature was included in the iOS11 update. 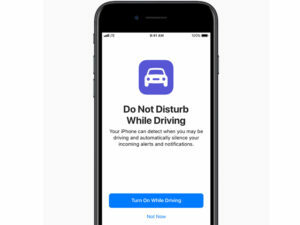 Introduced nearly a year ago, the iOS 11 update included a Do Not Disturb While Driving feature, enabling the iPhone to detect when users are driving and automatically silence notifications to keep the screen dark and avoid the temptation to check the phone. Drivers are also able to activate an auto reply feature for contacts listed in Favourites to let them know they are driving and cannot respond until they arrive at their destination. Now, research by the US EverQuote insurance marketplace among its community of 500,000+ users has found that drivers deploying the functionality exhibited an 8% decrease in phone use while driving, as measured by their EverDrive app. “This data is an exciting indication that the very same technology platforms that can facilitate distractions while driving can be used to address those issues given the right features and encouragement to use them,” said EverQuote CTO Tomas Revesz.